RUSSIA (RLPBs 364 and 365), where President Putin has defied the advice of business and church leaders and even his own advisors and signed into law a controversial ‘anti-terror’ package which includes anti-mission measures that eviscerate religious freedom. We now wait to see how the law will be applied and how it might be challenged. EGYPT (RLPB 366), where Egypt’s indigenous Christian Copts face escalating violent persecution at the hands of local radicalised Muslims increasingly confident they will never be charged. LUXOR: Morning Star News reports that at 2:30am on 16 July Copts in Al-Madamoud in Luxor Governorate were woken by the sound of flames ripping through the roof of the Church of the Archangel Michael. An iconographer, who was sleeping in the church while he worked restoring the church’s religious paintings, was trapped inside and had to be rescued by local residents. Firefighters arrived two and a half hours later, after the building had been thoroughly gutted. Local Copts suspect arson. On Sunday evening 17 July a group of Muslims armed with knives and batons attacked the families of two local Coptic priests in Tahna al-Gabal. The attack came after a group of four local Muslims harassed andthreatened Pastor Matta’os’ son, Mikhail (7), as he played outside the house under the watchful eye of his grandfather. When the grandfather protested, the Muslims became violent, attracting more Muslims. The grandfather Naguib Hanna (80) was stabbed several times in the face, as were Malak Aziz Hanna (40, the brother of another local priest) and a female Christian neighbour Azza Gouma (35). Mr Fam Mari Khalaf (27) was stabbed repeatedly in the chest and died. TURKEY (RLPB 367), where President Erdogan is exploiting the failed coup as an opportunity to eliminate his opponents, tighten his grip on power, advance his personality cult and further his dangerous Islamo-Turkic nationalism. The threat facing alleged ‘enemies of the state’ — i.e. Gulenists (liberal Islamists), Kemalists (secularists), as well as all non-Turks and non-Muslims — is now greatly heightened. The Evangelical Fellowship of India (EFI) reports that on Sunday 3 July a group of 12 to 15 Sikh men violently attacked Sikh convert pastor Satpal Singh (48) along with his elderly mother, son and nephew. The family was at the church early with a group of around 15 church women making preparations for the luncheon that was to follow the worship. While the church women were able to flee, the pastor and his family were trapped, abused and beaten. Pastor Singh’s 90-year-old mother was struck on the forehead with a brick and required hospitalisation. Pastor Singh told EFI that their church in Mallian village, Gurdaspur District, Punjab Province, has a congregation of some 60 members, all from different faiths. ‘While we have a good testimony in our neighbourhood, these eight Sikh families have come together and have been threatening us for more than a year now for spreading the Word and conducting Church and prayer services in the village.’ Please pray for Pastor Singh, his family, his congregation and his ministry. Pray also for his attackers that they will repent and believe. NADARKHANI: Having already endured several years in prison — between October 2009 and December 2013, including a death sentence for apostasy, subsequently overturned — Pastor Yousef Nadarkhani is again being threatened by the Iranian regime. On 13 May the pastor and his wife, Tina, were temporarily detained after Iranian Security Service (VEVAK) officers raided their home in Rasht as part of a series of raids targeting approximately ten Christian households [see RLPB 358 (May Update)]. On Sunday 24 July Pastor Nadarkhani was summoned to the 13th Branch of the Revolutionary Court in Rasht. He was formally charged with ‘acting against national security’ and accused of Zionist activities and evangelism. He has been given until 31 July to raise 100 million Toman (US$33,000) bail or face arrest. MARYAM: Though granted medical furlough in June 2016, gravely ill Christian prisoner Maryam Naghash Zargaran was escorted back to Evin Prison on 27 June after the court ruled she must continue serving her four-year prison sentence on charges of ‘acting against national security’ [seeRLPB 363 (June Update)]. Still gravely ill and suffering both physical pain and psychological distress, Maryam commenced a new hunger strike on 5 July, demanding ‘immediate and unconditional release’. An Iranian court has rejected her demand at the request of the Iranian Ministry of Intelligence (MOIS). Prison medical staff who examined Maryam on 20 July report that her blood pressure is very low and that she has pains and numbness in her feet; possibly early signs of multiple sclerosis. Please pray for Maryam and for the Church in Iran. Eight Christian teachers/counsellors charged in June with proselytising will soon face court. The seven men and one woman (pictured) were arrested on 9 June for distributing religious booklets in a Christian school [seeRLPB 363 (June Update)]. In April the Himalayan Times reported that Christian-run orphanages with access to foreign funds are ‘preaching Christianity to young minds’. Like schools, orphanages are in the firing line, and in the past few weeks a number of Christian social workers who run orphanages in Nepal have been arrested for proselytising and charged with human trafficking. Chinimaya Blown runs a children’s orphanage in the capital, Kathmandu, and prays with the children in her care. She was arrested on 24 June and is currently being held in a Kathmandu jail facing charges related to human trafficking. On 19 July police in Chitwan (about 160km south-west of Kathmandu) arrested Pratik Sunar and his wife whom they accuse of running an unregistered children’s home where they engage in ‘unnecessary promotion of Christianity’. Whilst Mrs Sunar was freed after objections from local residents, Mr Sunar remains in police custody. Pray for the Church in Nepal. On Saturday morning 9 July Eunice Mojisola Olawale (41), a deaconess in the Redeemed Christian Church of God which her husband pastors in a suburb of Abuja, went out preaching in the streets of Kubwa as was her routine. That Saturday, however, was to be anything but routine for that morning, as Eunice preached ‘the blood of Jesus’, a band of Islamists stabbed the mother of seven to death. Eunice had been street preaching for some six years, following in the footsteps of her evangelist mother. Though grieving deeply, her husband, Pastor Olawale Elisha said his one desire is that ‘the killers repent and join her in heaven’. NOTE: The strategic situation may be about to shift in a way that bodes well for Syria. Recognising that it has run out of options, the US has agreed to co-operate with Russia in the fight not only against Islamic State, but against al-Nusra (al-Qaeda) which has long been protected by its close ties with US-backed ‘rebels’. Furthermore, Turkey — which has done more to facilitate the jihad in Syria than any other state — has buckled under the stress of Russian sanctions, apologised for shooting down a Russian jet, and is seeking rapprochement with Moscow. This could lead to Syria’s stabilisation and save Syria from a US-Turkey-Arab backed Islamist takeover. May GOD bring peace and security to Syria. 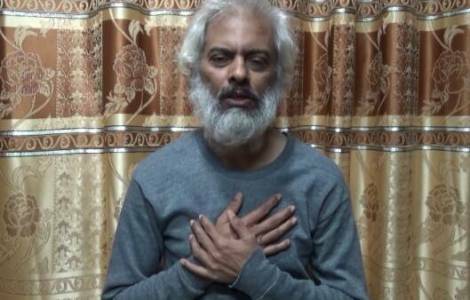 On 19 July a photo appeared on the Facebook account of Father Tom Uzhunnalil that appears to be a photo of the kidnapped Indian Salesian priest. Father Tom (56) had been praying in the chapel of a Missionaries of Charity care home in Aden when it was stormed by Islamic State jihadists on 4 March. Eight residents and four nuns were killed, while Father Tom was kidnapped [seeRLPB 348 (16 March 2016) includes earlier photo of Father Tom]. Bishop Paul Hinder, the Apostolic Vicar of Southern Arabia, believes the photo is authentic and that it is Father Tom. There is no indication of who posted the photo or why. Please pray for Father Tom and for the Church in Yemen.